i was very pleased with this product because it was well constructed and the color was beautiful. I bought 4 bells. Lovely engraving, great as gifts. And the sound when you ring the bell is beautiful. I used this on our tree for another granddaughter and it was great. The color is a very rich blue and it beautifully engraved. It also has a lovely sound when it is rung. I bought these as gifts and was very pleased with them and expect they are going to be well received. Plan on buying some more as Christmas gifts. Beautifully constructed and personalized and dated as I requested. The color is beautiful and the sound is sweet. Should have been able to give it more stars. I have bought many ornaments from Miles Kimball and have been pleased with every one of them. 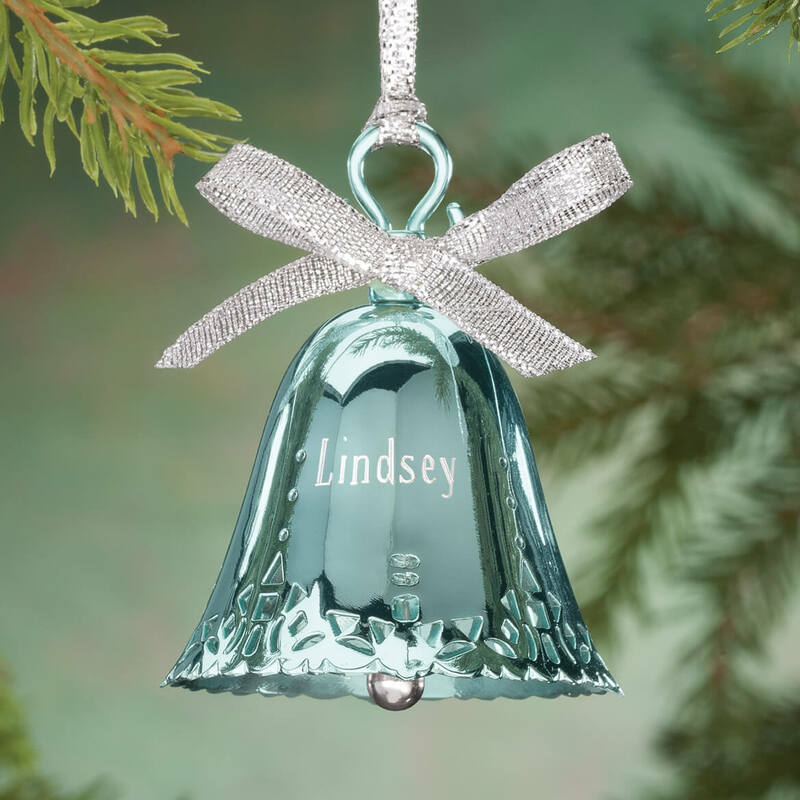 This sweet bell, however, is absolutely stunning. 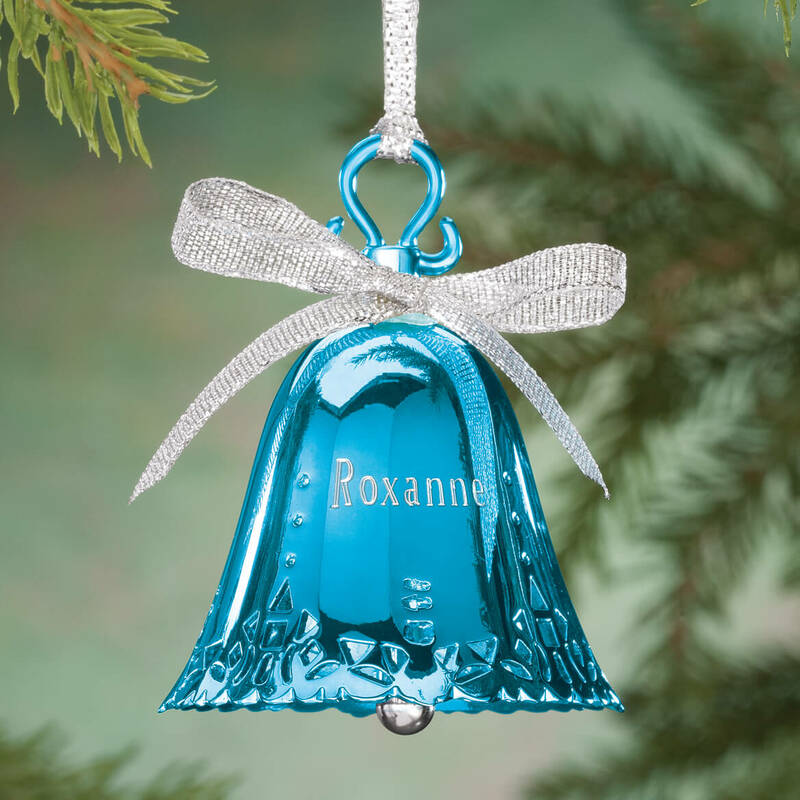 The birthstone color for March is aquamarine and this bell is that soft, unusual color. The font for the personalization is classy, could have been a bit larger, and the detail on the bottom rim of the bell is exquisite! The prettiest little bell ever! 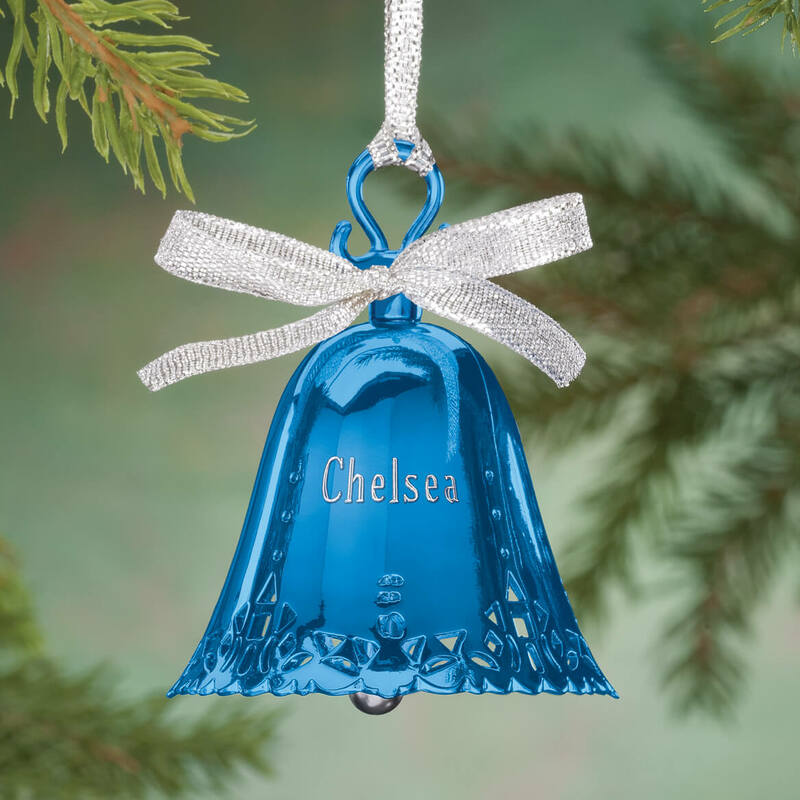 This is a bell to place on the the Christmas tree with the name of my Grandson. It is very pretty. The only thing I would say is the name on the bell should be more pronounced. Christmas ornament is so cute..I bought 3 different months and they look nice on the tree. 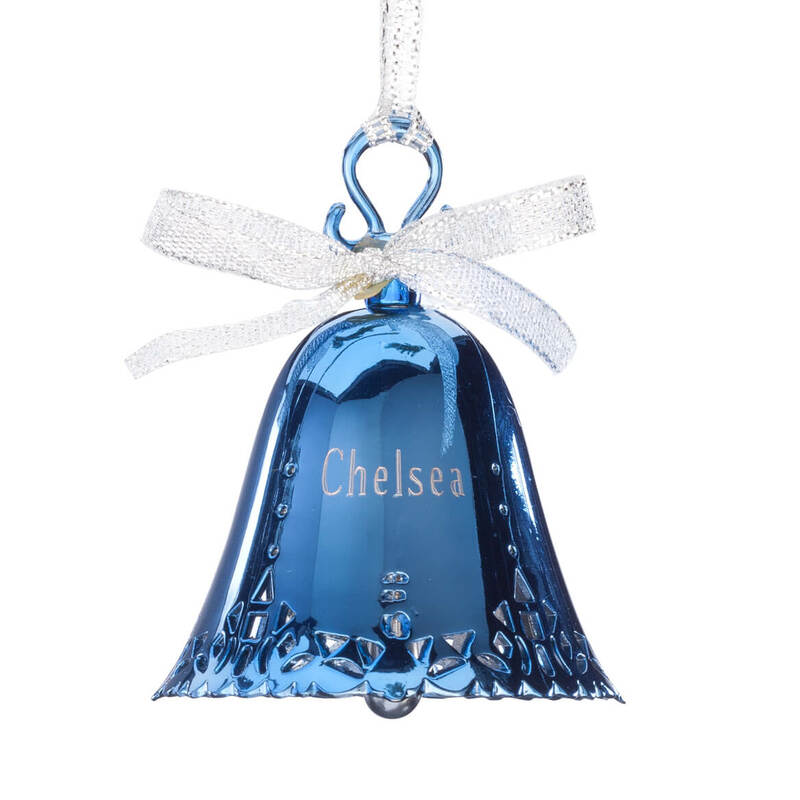 Bought 6 Birthstone Bell Ornaments for my grandchildren (ages 1-8) this Christmas. The bells are darling, and the jingle is what they'll love the most! Not as happy with the personalized names, as some of them are difficult to read. Called Customer Service to have one of them replaced (blurred lettering), and they were happy to replace it as soon as possible. 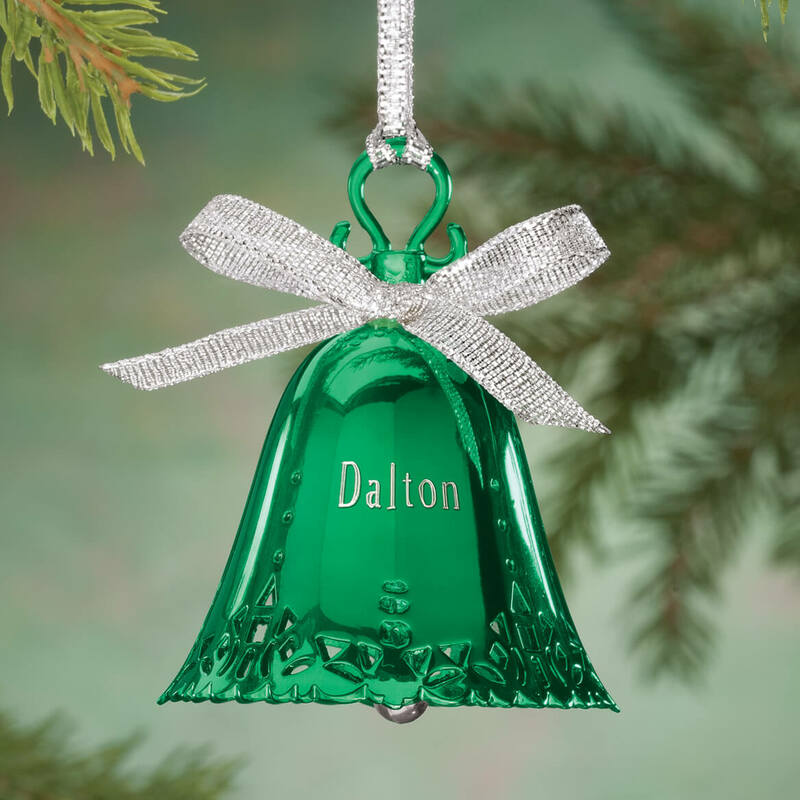 Overall, I'm pleased with the personalized Birthstone Bell Ornaments, would recommend them for anyone (as long as Customer Service is available if needed), and know my grandchildren will love them! 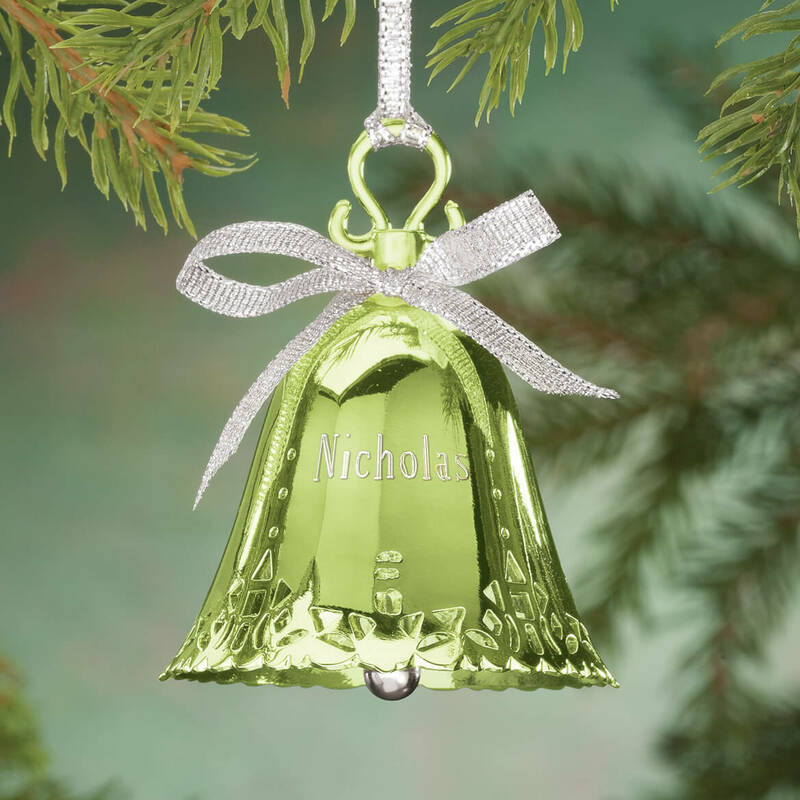 I ordered this bell for my niece and had to have it redone because the personalization was done so badly. It's a pretty little bell, but very cheap looking in person. Still pretty enough to order, but don't expect perfection. I was very disappointed when I opened the package and found "little " bell in various colors. From the looks of the bells on the advertisement, the bells looked like they were made of glass. The bells are cute, but definitely not worth the price I paid for each one. They are only about 2" tall. Guess I will use them as stocking stuffers. VERY DISAPPOINTED!!! ?? Not happy. Writing on bell is barely legible. Bell is pretty but not good for personalizing. Worst engraving I've ever seen on items from Miles Kimbell! Purchased two of these bell ornaments, & both were poorly engraved! The engraving appears somewhat uneven, but, even worse, and significantly chipped the "birthstone color" around the engraving on both bells. Totally unacceptable and disappointing. Never had this experience before with any of the ornaments that I have purchased from MK over the past several years. Even more disappointing was having to spend over an hour talking to someone with very poor command of the English language trying to describe the problem and trying to reorder. Haven't received the replacements yet. Hopefully they will be acceptable! Don't buy colors and have them engraved. They chipped the paint all around the lettering. When having it replaced they didn't even process the order. Don't buy this and don't think of personalizing it. The coating on the bell flaked off when the engraving was done, making it very unsightly and not giftable. I purchased this product and had to wait weeks as it was on backorder. I was so excited when it finally arrived. I was so disappointed when I looked at....you can't see the engraving it's so light. Yes, it is a silver bell, but I've purchased other silver engraved products for MK for years and never had this problem. One would think that the engraver would look at the product before sending it off for shipment and think "hey, this is too light and needs to be redone." I contacted customer service who said they'd pass along my comments to the engraving department. No offer to redo the ornament. I am very disappointed as this was to be a very special gift for a cancer surviving couple. MK's quality is just not what it used to be and neither is its customer service. 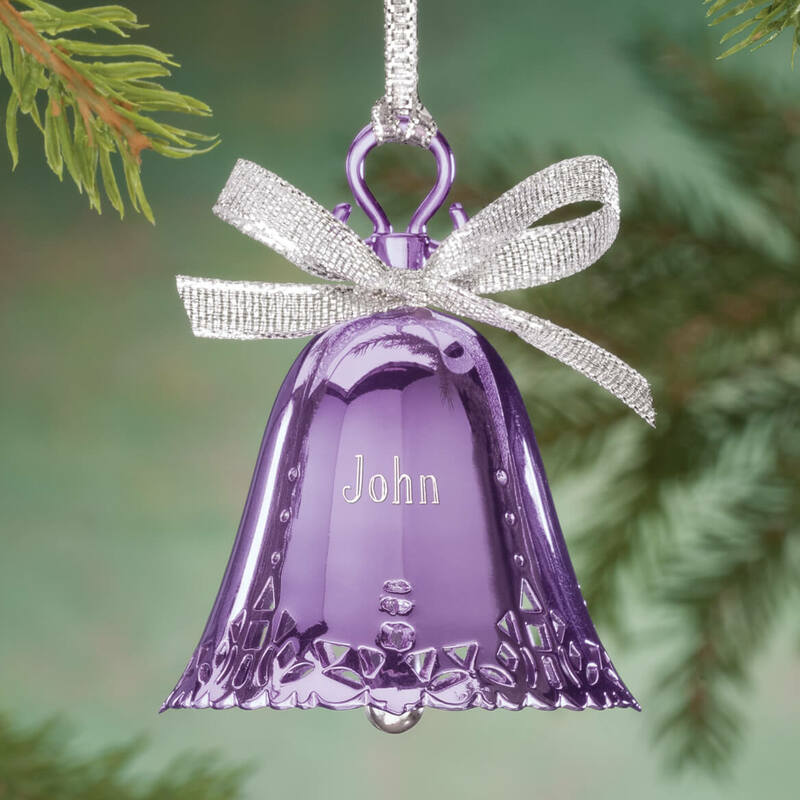 I really liked the color of this bell and I had it personalized for my first grandson. I think it will look nice on their Christmas tree. Great Deals!! Really like the buy 2 get 2 ornaments free! and free shipping over $39. Not to mention the option of personalization. Because it could be personalized with the name and year on it for my granddaughters. I give a new bell ornament every year. This is for a friend of mine who is special to me and thought this would look beautiful on her Christmas tree. The bell is perfect for my very special cousin. this great grand child is no longer a toddler so she will like this one. 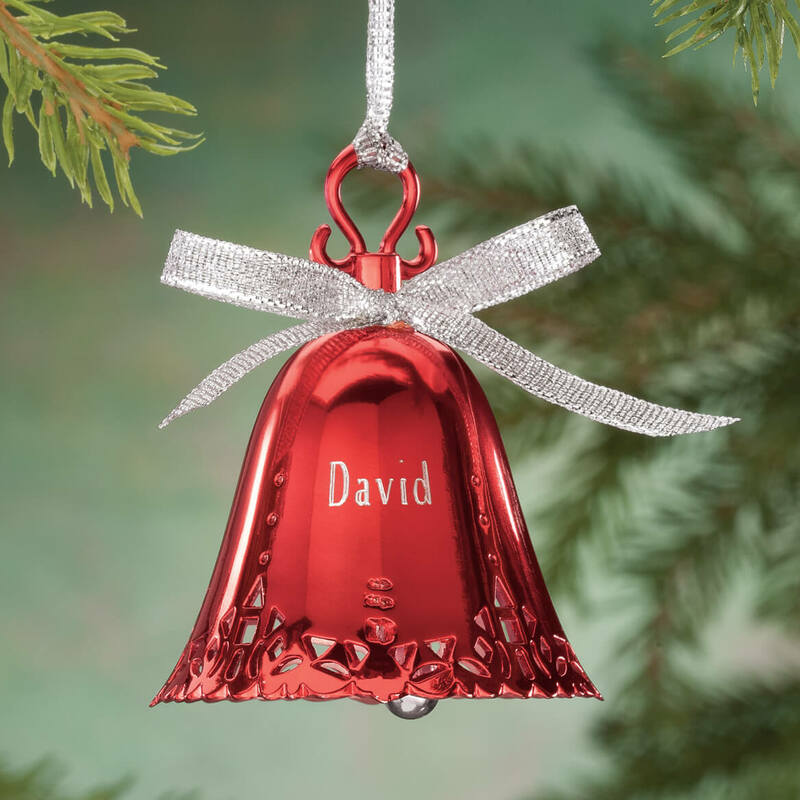 The ornament is beautifully made and it is hard to find personalized ornaments for my children's names. You didn’t ask me how to personalize before charging me!!! Want the name “Marlou” on pink bell ornament. Because they have the best IT department in the world! Love the fact I could personalize each of them, along with getting them in the birthstone color for each granddaughter. I ordered all of these because they were very pretty, but didn't get full credit off for them. I wanted something unique and different for my Granddaughter to have for years to come. I just thought it was beautiful. Each year I give the grandchildren a personalized ornament. It was so beautiful and the different colors where also nice. I love bells and these are very delicate and lovely. I wanted something special for a very special friend. I love this ornament!! Bought it as gifts before! I picked this because it can be personal. The color for month of each person makes it very special. I like that you can choose the color you want and personalize it as well. its very pretty and thinking of my loved ones. For my granddaughter, who shares my birthday! 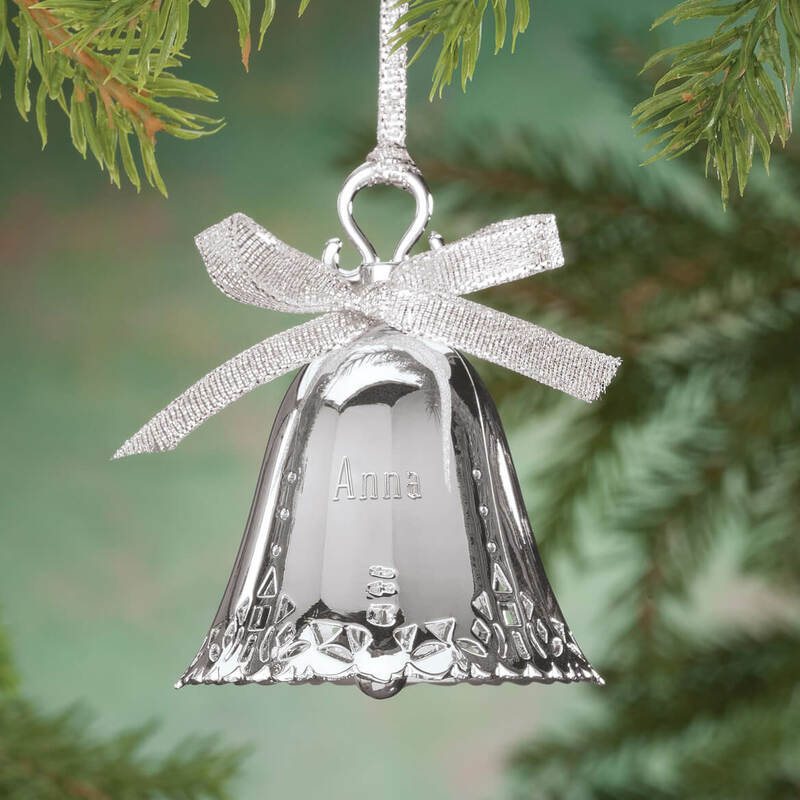 The bells are just plain beautiful and make a wonderful addition to the tree ornaments. I chose these because i thought it would be something they could use year after year. I bought a red one with my son's information and a green one with my daughter's so they will become keepsakes for them in the future. How do I see all of the Birthday colors? BEST ANSWER: Thank you for your question. Please click on the month you would like the color will be displayed. We hope this information will be of help to you. Why no July or September? BEST ANSWER: Thank you for your question. We should be receiving all of them in stock at the end of October. We hope this information will be of help to you.